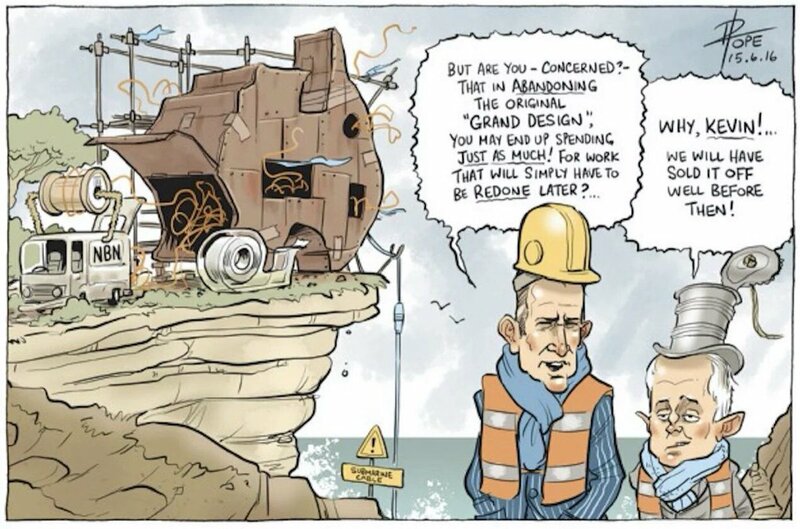 Apart from the distraction of poor bear with little brain Sharri, driven from the lizard Oz and now scribbling for the Terrorists, what a tremendously distracting line she produced with "PM Malcolm Turnbull made a rare misstep ..."
Sorry Gra Gra, by definition, the pond is now an investor in Aquaman, and it will download it for free in due course. 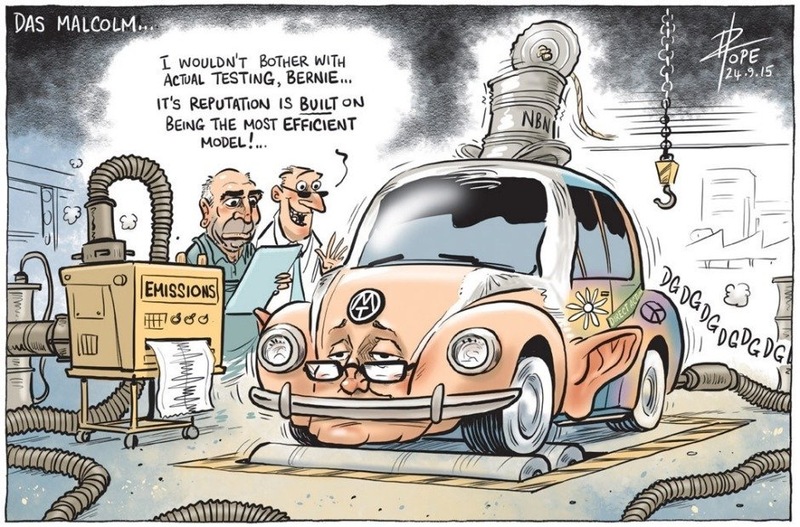 Of course the remarkably incompetent Conroy made any number of basic mistakes - from pork barreling the roll out to grandly talking, in the manner Burkey wanted, of a great big internet filter for everyone. The worst part of the pork barreling was that the NBN rolled out to assorted areas without rhyme, or reason and without commercial sense. The way to have done it was to have upgraded high traffic areas, generated cash flow, and then moved on to more remote and expensive locations requiring ongoing subsidy. And yet such was the inept planning that the remote areas have also been short-changed ... listen to the deafening wails about the speed and data caps on remote services which make them as irritating as dial-up. 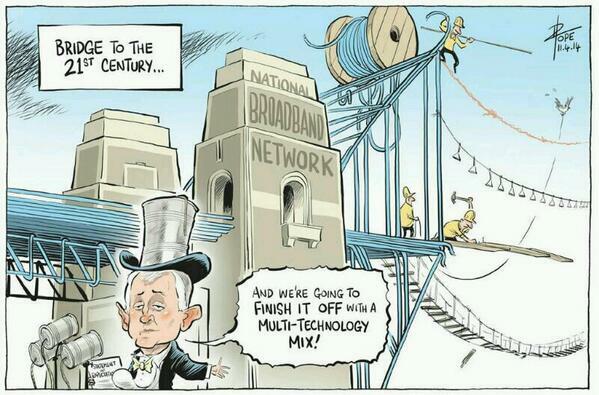 As a result of all this, NBN has become hated in rural areas and gazumped in many city areas. 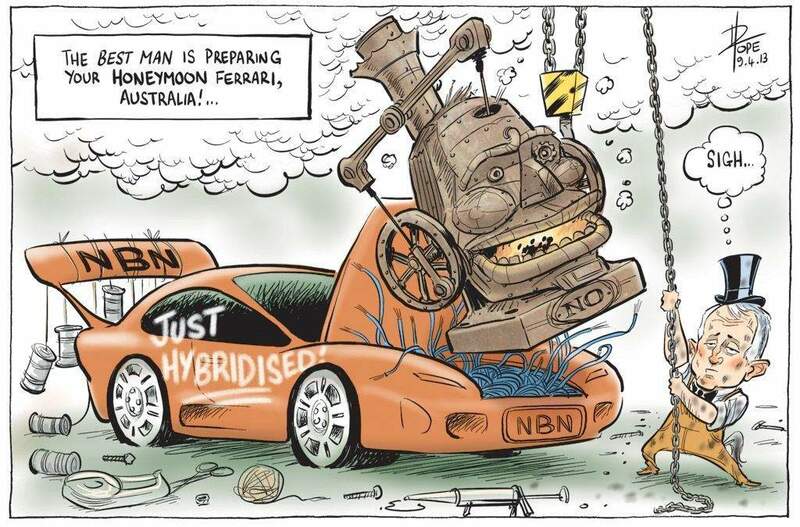 So the pond's son has both NBN and a rival commercial supplier providing fibre to the basement services, while the pond makes do with a choice between HFC - in urgent need of replacement - and sodden, corroded copper ... with the now exiled Optus doing absolutely nothing to maintain its service, and the NBN recoiling from the too hard to fix copper lurking in the inner city trenches. Actually there doesn't need to be limitations to capable government. 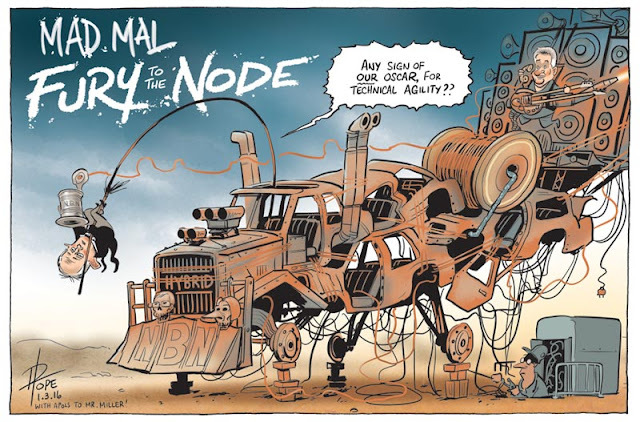 Surely the NBN disaster has resulted in one of the richest veins in political cartooning since the time of federation. Christensen wants to fire up the Duterte thing here ...Katter's Adler shotgun loons? 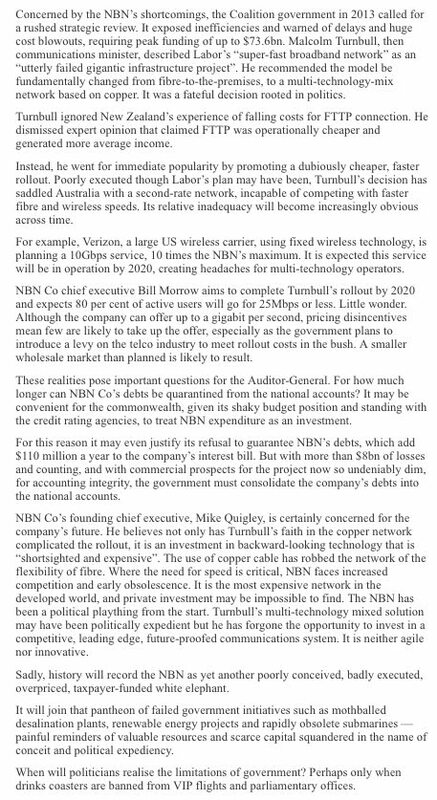 and perfectly confounded as intended by NBN / nbn(tm) a sample Bolter reader Richard comments "The proponents of FTTP shouted to the rooftops that wireless could never deliver the speeds of the NBN. Yet here we are, with the NBN not even near completion and a wireless system 10 times the speed is announced. Gee. What a surprise." When the keeper is insane how is there any sanity in the asylum? Comments are disabled at nbn Australia - a publicly funded nbn YouTube channel. "Thing is PMG was requested to produce a viable plan to upgrade the countries telecom infrastructure, A plan that was to take 30 years to complete, be done in 2 or 3 stages, and last upto 100 years. Part 1 Instal fibre backhaul all over the country into every exchange. Part 2 Replace the last mile copper with fibre. Part 1 was completed by the early 90's and in the mid 90's Telecom as it was then known gave the government a plan[part2] to instal FTTH that was to have been completed some time in 2010. Howards Liberal's got in and immediately canned that. Renamed Telecom to Telstra and sold the the whole kit and caboodle as one, instead of splitting Telecom into two companies One Retail named Telstra and one named Telecom Infrastructure. Abbott's Coalition gets in 2013 and sets about screwing up the telecom sector via the NBN with Malcolms MTM model which all the experts said would be a total waste of taxpayers billions as copper is DEAD TECH. 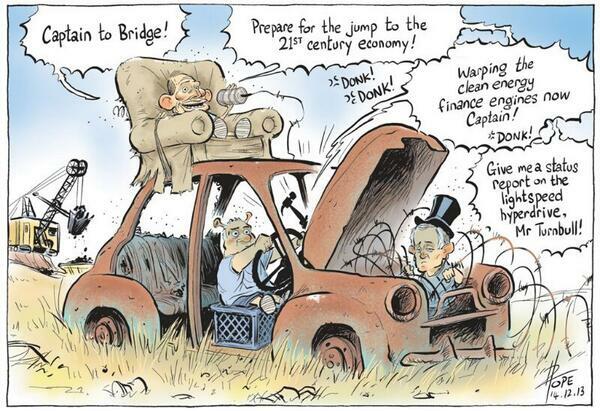 Australia screwed by the Coalition No2"
"What is the total cost? 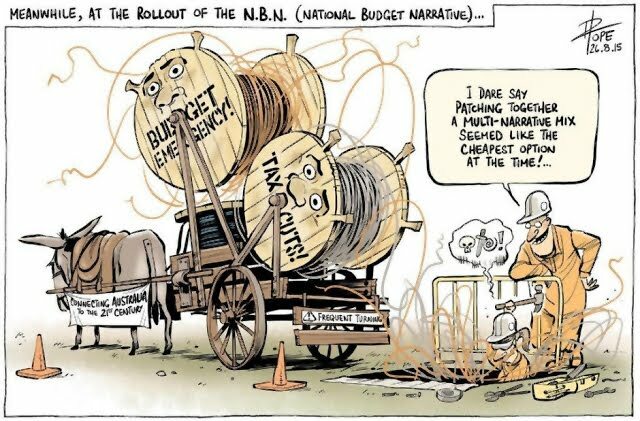 The NBN (MTM) is now roughly $56 billion. If you are connecting in a greenfield installation, you have to pay up front. I can't remember if it is $400 or so. Now an additional $7 per month on top. I thought it was supposed to be cheaper. No it's not. Not to build, not to run, not to administer, not to repair, not to use and certainly not to replace. It was supposed to be sooner. No it's not. 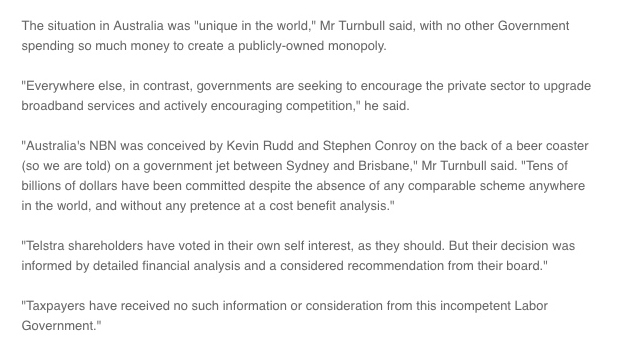 Who holds these politicians accountable for their choices based purely on opposing? 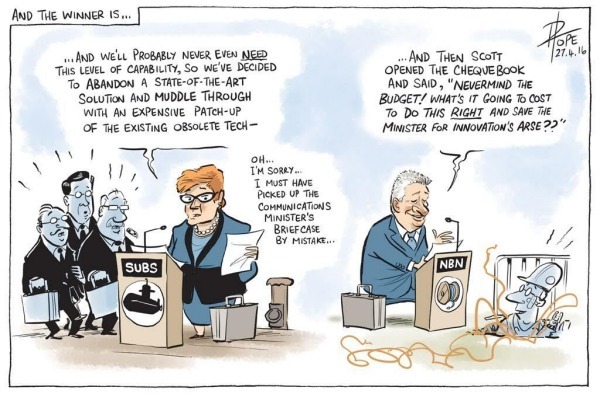 And as for saying FTTP is crap because it was designed on a napkin, that speaks to me of the simplicity of the system. How many napkins did it take to design each and every part of the MTM?" Most great idea's are born on rudimentary materials. Even drawings on sand. People who slam the idea of making designs or drawings on napkins or similar don't really have much of an imagination and its a cop out. With the savings being that the government didn't have to pay for fibre from the node to every single household? 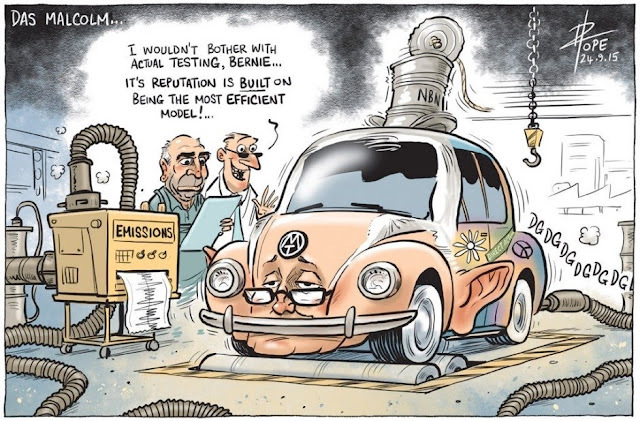 That was the 2013 election lie – since then the true facts have emerged which has seen the FTTN/MTM cost almost double, the FTTN rollout time go from "by 2016" to "maybe by 2020" and failure after failure. 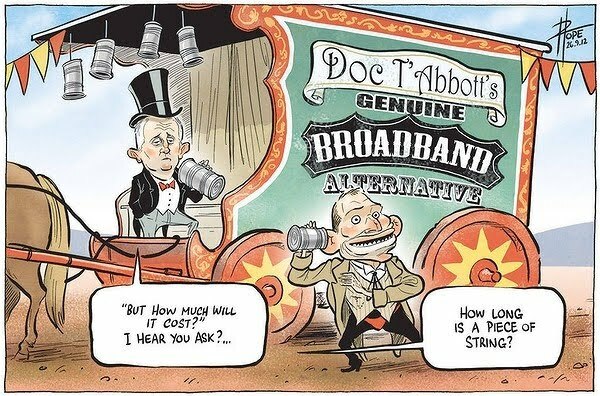 Have a I missed some sort of business or policy decision that means they would have made more from FttP? FTTP costs a similar amount to build upfront, has a higher revenue potential, has lower ongoing costs and has decades longer useful life. Forgive me if this is a stupid question, but a lot of people seem to be saying that the original FttP would have been cheaper than MTM. Isn't MTM basically just FttN, and copper for the last 500m or so? With the savings being that the government didn't have to pay for fibre from the node to every single household? Fttp: pay it once, no maintenance cost, no running cost, all you need to change in the future is the laser transmitter on one end or both end. 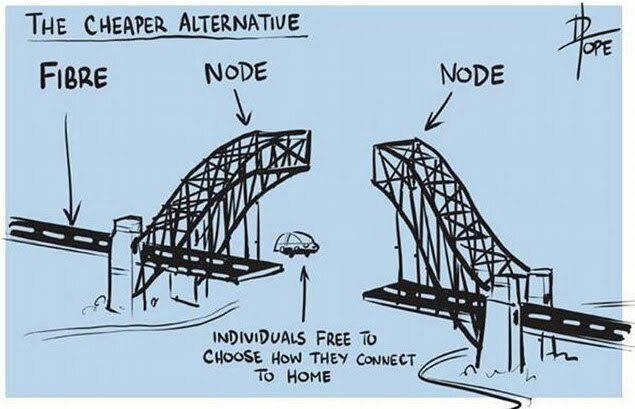 Fttn: Pay a lot of times, speed depends on the quality and the length of the copper from Node, running cost, maintenance cost and depreciation cost for the Node. so called G.Fast/XG. Fast in the future is just to extend the life of the copper. it can never beat the speed of light. Implementation of G.fast/XG fast, there will be another cost. 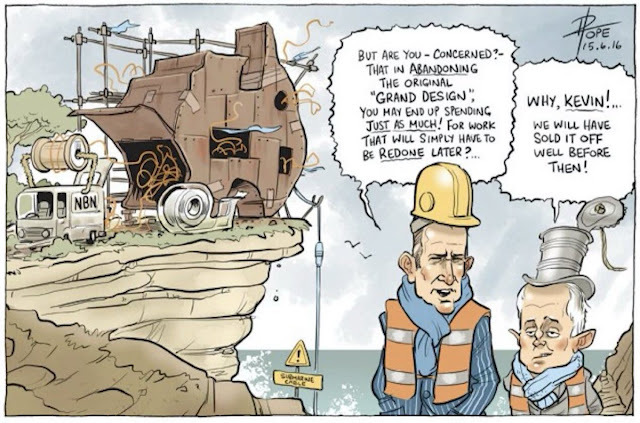 On top of those, last year, this gov just bought 18000km of copper to replace poor quality of copper, as they are so poor for broadband, also paid millions of dollar to Optus/Telstra for their HFC, at the end, they found out, the conditional of those HFC were to poor either. Those costs could have been avoided, and do not forget the gov just paid 10b to Telstra for compensation. Isn't MTM basically just FttN, and copper for the last 500m or so? Keep going, 900+ meters from the node, to the pillar, to the bottom end of the street. That last mile, is where most issues are that affect services and require continued expensive maintenance. Some people in some towns are losing perfectly good ADSL to be forced on satelite. 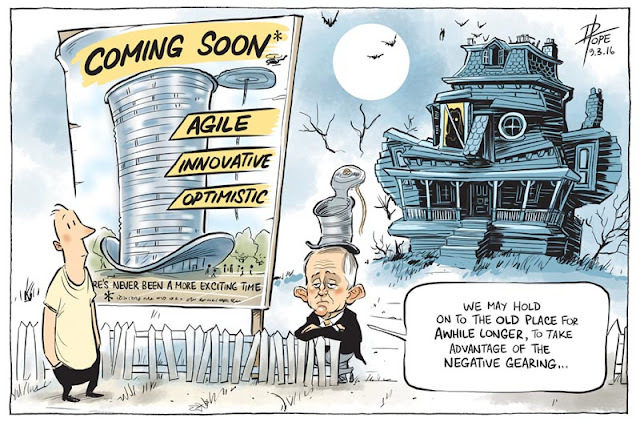 So at worst, the majority of Australians are no worse off, and the last few pages has just been NBN and government bashing? My next door neighbors NBN had hsd more downtime and issues sice march than my ADSL has had in 3 years. Some people have been forced from perfectly good ADSL services onto satellite, simply due to pre-ordained "footprints"
I read that MTM ranges from about 50-100mbit. Huh? You're kidding, right? Is that you Donald? Which of the completely transparent third party costings would you care to criticize? For those interested I was again asked for an impromptu interview on 612ABC in Brisbane this morning with Steve Austin. Starts about 8 minutes in. Great Interview. Loved the way Steve (the average Australian with limited knowledge of technology) was gobsmacked to find out the truth about what is actually happening. Includes limitless broadband quota, 80 - 100 Mbps download, and "netphone" phone deal. "Ultrafast" iiNet Cable Plans - some locations - half price @ $39.99/month for first 12 months of 24 month term. Summary: Users' bandwidth grows by 50% per year (10% less than Moore's Law for computer speed). The new law fits data from 1983 to 2016.